Connell Gauld of Extra Reality Limited entertained an audience at this Monday's CHASE meeting on Mills & Reeve's Cambridge premises. 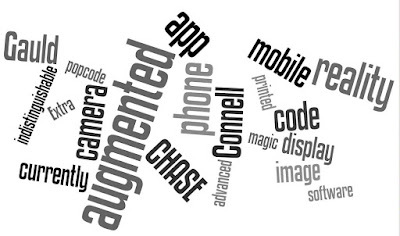 The talk was on the linking of a printed code with a mobile phone app so that the camera on the phone could be overlayered with an augmented reality display. “Any sufficiently advanced technology is indistinguishable from magic” pronounced the farseeing Arthur C Clarke in 1961. It was an astute Connell Gauld who used the Hogwart's posters of Sirius Black in motion at the CHASE meeting, to demonstrate that the magic in a film is now indistinguishable from advanced technology. Take a static image with an embedded code and your mobile camera will display an augmented image that moves, reveals hidden detail or any other effect you desire. The particularly neat feature is that as you change the camera view by moving it around, the augmented image on the screen behaves in the same way. That is, if you have a decent mobile phone (i.e. a more expensive model, like the i-phones and i-pad). My Nokia E63 was sadly not up to the task and currently, neither are Blackberrys. The popcode, whilst a great mnemonic and visually appealing, is not actually essential. The audience rapidly pointed out that QR codes or other barcodes could work equally well if the app can be made to recognise them. It is the app and the software to create, then implement, the bespoke augmented reality animation that is key. Connell Gauld and Extra Reality Limited currently have an edge in development time for this particular form of augmented reality and are currently seeking to employ this technological lead to their advantage. This was an excellent and exciting presentation, especially as Connell Gauld seemed to relish the numerous interruptions and questions. CHASE are to be congratulated for organising the event.